I chose this cruise for the great destinations. We stopped at Half Moon Cay Bahamas, St Thomas, Puerto Rico, and Grand Turk. The Bahamas and Grand Turk were the best two locations with plenty to do as soon as you walk off the ship. This part of the cruise was outstanding but other factors bring me to an overall average rating. First, I have never seen maintenance used on a cruise ship like it was used on the Carnival Glory. I was in the buffet line waiting for my omelete when I see a maintenance worker walking through the dinning room in dirty blue coveralls with a volt better hanging out of his pocket. I thought this was a poor display of consideration for customer satisfaction and not very appetizing for me at breakfast. On another occasion at dinner in the Lido Deck buffet, as I was sitting and eating dinner I notice a few feet away from me two maintenance workers repairing tiles inside the dinning room. They were wearing dirty coveralls and mixing grout. I witnessed them pour the grout in a dirty bucket and saw grout dust fly into the air way too close tower I was eating. They were also cutting tile at the time. I feel these type maintenance repairs should have been conducted when the dinning room was closed and shows absolutely no safety and hygiene regard for passengers eating their dinner. All throughout the ship I noticed maintenance workers with vacuum cleaners and extension cords near stairwells at times of high traffic. These functions should be done in the late hours of the evening when passengers are sleeping and during low levels of traffic. As far as entertainment, the Caribbean Boyz were outstanding and i found myself following them everywhere they performed on the ship. Derrick Eason was the only comedian that was outstanding. He had a great message and was very entertaining. As far as other areas in the ship such as the Gym, an attendant named Indra basically saved the cruise from being a disaster by finding a lost cell phone and promptly turning it into the front desk on deck 3. During this trip we only booked one shore excursion in Grand Turk. The Hummer Wildlife Tour was one of the best shore excursions I have ever had in ten years of cruising. The tour incorporated wildlife and history tours and was very enjoyable. The ship itself is a nice design. The only caveat to that assessment is the placement of the casino in the middle of deck 5 where you must walk through to get to other areas of the ship. The casino is a smoking zone so if you are a non smoker you will not enjoy having to navigate through this area on sea days. Most other ships I have been on place the casino in an area that as separate from the main common areas. So many things were outstanding and many things were poor on this cruise. That is why I come to an overall average rating. Great Itinerary but very low level of consideration for customer satisfaction. I chose this cruise for the great destinations. We stopped at Half Moon Cay Bahamas, St Thomas, Puerto Rico, and Grand Turk. 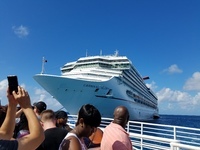 The Bahamas and Grand Turk were the best two locations with plenty to do as soon as you walk off the ship. This part of the cruise was outstanding but other factors bring me to an overall average rating. First, I have never seen maintenance used on a cruise ship like it was used on the Carnival Glory. I was in the buffet line waiting for my omelete when I see a maintenance worker walking through the dinning room in dirty blue coveralls with a volt better hanging out of his pocket. I thought this was a poor display of consideration for customer satisfaction and not very appetizing for me at breakfast. On another occasion at dinner in the Lido Deck buffet, as I was sitting and eating dinner I notice a few feet away from me two maintenance workers repairing tiles inside the dinning room. They were wearing dirty coveralls and mixing grout. I witnessed them pour the grout in a dirty bucket and saw grout dust fly into the air way too close tower I was eating. They were also cutting tile at the time. I feel these type maintenance repairs should have been conducted when the dinning room was closed and shows absolutely no safety and hygiene regard for passengers eating their dinner. All throughout the ship I noticed maintenance workers with vacuum cleaners and extension cords near stairwells at times of high traffic. These functions should be done in the late hours of the evening when passengers are sleeping and during low levels of traffic. As far as entertainment, the Caribbean Boyz were outstanding and i found myself following them everywhere they performed on the ship. Derrick Eason was the only comedian that was outstanding. He had a great message and was very entertaining. As far as other areas in the ship such as the Gym, an attendant named Indra basically saved the cruise from being a disaster by finding a lost cell phone and promptly turning it into the front desk on deck 3. 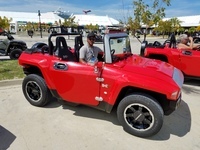 During this trip we only booked one shore excursion in Grand Turk. The Hummer Wildlife Tour was one of the best shore excursions I have ever had in ten years of cruising. The tour incorporated wildlife and history tours and was very enjoyable. The ship itself is a nice design. The only caveat to that assessment is the placement of the casino in the middle of deck 5 where you must walk through to get to other areas of the ship. The casino is a smoking zone so if you are a non smoker you will not enjoy having to navigate through this area on sea days. Most other ships I have been on place the casino in an area that as separate from the main common areas. So many things were outstanding and many things were poor on this cruise. That is why I come to an overall average rating. The cabin was very nice. Plenty of room with a larger bathroom and jacuzzi. The balcony was larger than normal in the junior suite and the room attendants were very professional.No problems at all with the junior Suite ! Hummer Wild Life tour was excellent. One of the best tours I have taken in ten years of cruising and one of the best islands I have visited in the caribbean. No booking necessary for Margaritaville. The food was very good. I had a grouper sandwich and a pina colada drink that was incredible. The only caveat to this place is its not very family friendly. Too much drinking, gyrating, wild drinking games and somewhat vulgar activity for young children. No need for a shore excursion when all activities you could possibly want are right here as soon as you get off the tender boat. Great time and a great barbecue made by the carnival staff. Miami is a beautiful place but crime is very high and you must stay on guard if your going to be in this area. You must drive a distance to get to any beach for swimming. You must also be on guard against crime in this area. Nice place to see a few historic sites like the military fort at the top of the hill. Excellent place to shop and buy nice jewelry and watches. Despite a few problems, we had a fabulous time with so many fun people!